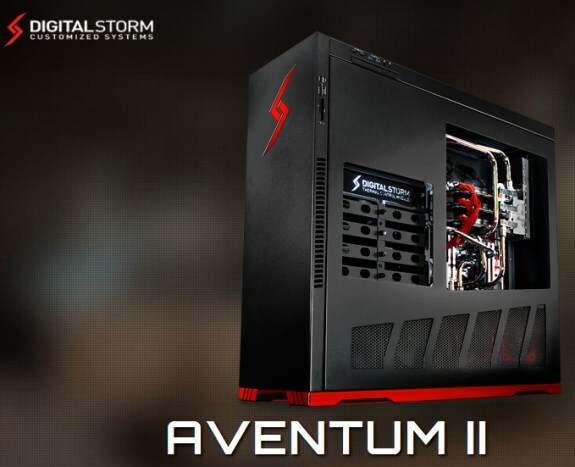 If money isn't an issue you might be interested in the new Aventum II series from Digital Storm. With base price points from $4,999 to $9,500, this is definitely one of the most expensive gaming PC lineups we've ever seen. For this price you do get high-quality components, including a custom-built case and custom exotic cooling. Full details and specifications at Digital Storm. For more than ten years Digital Storm has worked diligently to build some of the world’s finest, high-performance computers. That commitment to building the best culminates today with the release of Aventum II, a system that is as much a work of art as it is a finely tuned piece of technology. Digital Storm’s in-house team of engineers designed every inch of Aventum II, incorporating ten years’ worth of the most challenging customer requests to create a dream machine. They knew there was no off-the-shelf chassis or cooling solution that could meet the extreme requirements of Aventum II, the world’s most advanced performance PC. Crafted exclusively from steel and copper, Digital Storm did not use any plastic in the construction of Aventum II. The exotic nickel-plated copper piping solution was inspired by high-end automotive cooling systems and is handcrafted, ensuring no two Aventum II’s are identical. Combined with three huge 420mm radiators, the liquid cooling system is as efficient as it is beautiful and fully capable of unlocking the maximum performance potential of the Aventum II’s bleeding edge components. Each Aventum II is deployed with a full payload, armed with the best components available. This includes configurations that feature overclocked Intel Core i7EE processors and NVIDIA’s GeForce GTX TITAN graphics card. All that power requires an advanced thermal control system. Aventum II’s intelligent system monitors five critical thermal zones and automatically regulates its 22 chassis fans accordingly. Unlike many liquid cooled systems, that inefficiently cycle hot air from radiators straight into the heart of a PC, Aventum II employs a completely isolated exhaust chamber design. Hot air from the radiators is channelled under the power supply and out via a rear exhaust vent. Other distinctive Aventum II features include a dedicated side intake fan for the graphics cards, the ability to support two power supplies and the inclusion of 8 hot swappable hard drive bays. A removable front panel allows for easy access to the front intake fans for maintenance. Prior to shipping to the customer, each Digital Storm system undergoes a rigorous 72-Hour Stress-Test. Digital Storm technicians stress-test and benchmark the system via industry standard testing software coupled with a proprietary testing process that detects components which can be prone to future failure.